TMD Treatment - Dr. Isaac Comfortes, D.D.S. If you have tense, tender, or even acutely painful jaw muscles, Total Health Dentistry of Encino can help. 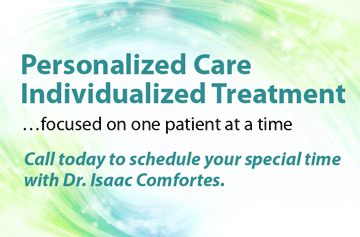 Dr. Isaac Comfortes can help with diagnosis of what is triggering your pain. He can help with bite splint therapy to relax overworked jaw muscles. He can provide you with an occlusal nightguard to protect your teeth from grinding and relax your jaw muscles while you sleep. He can treat your teeth to evenly distribute biting forces that eliminate undue tension of the jaw joints and muscles. Because stress is a component of TMD in many cases, we recommend you attempt to reduce chronic stress in your life. 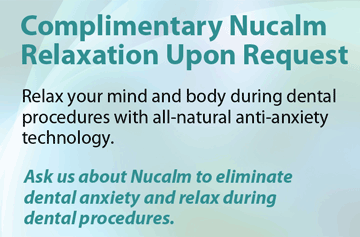 And, during your dental visits, you may experience the NuCalm™ system so you have a relaxation experience that leaves your body de-stressed. Temporomandibular joint disorder (TMD) (otherwise known as “TMJ” or “TMJD”), is a general term that encompasses pain and dysfunction in some form of the muscles that are responsible for moving your jaw. The most significant symptom of TMJD is pain, although difficult jaw movement may also accompany it. If you suffer from headaches, ear aches, tenderness of the jaw muscles, or aching facial pain, you may have TMD. TMD can have a variety of causes, but most typically occur when the teeth do not come together evenly, and when they interfere with the chewing muscles and jaw joints working smoothly. Nighttime teeth grinding (bruxism) and teeth clenching are also significant contributors to TMD. And, these are related to both occlusal interferences and stress in your life. TMD is commonly associated with extensive wear and tear on teeth. Enamel wears down faster. Hairline cracks appear. Periodontal ligaments become painful. And, left untreated your TMD and dental damage can lead to the need for extensive dentistry to save and replace your teeth. Don’t hesitate to schedule a consultation that will change your quality of life! The experience and expertise of Dr. Isaac Comfortes in the area of TMD diagnosis and treatment will be focused on your specific oral health circumstances. Bite split and nighttime occlusal guard therapy is noninvasive. While relaxing jaw muscles and protecting your teeth, it allows the jaw joints to comfortably seat and for Dr. Comfortes to create the most effective plan for creating your optimal bite. 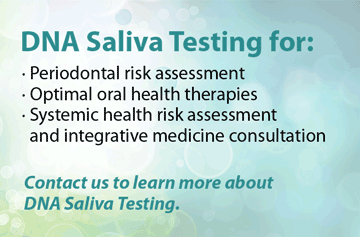 A lifetime of comfort, healthy function, and decreased risk for dental damage are the primary goals of this therapy. Go from a life of pain and oral health problems to a life of comfort and minimized oral health costs. And, in the process, enjoy more relaxed, comfortable nights of restoring sleep. 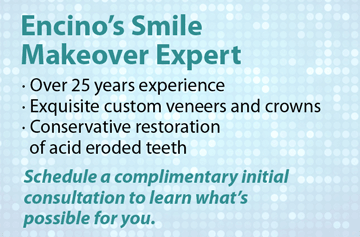 Let Dr. Comfortes help you with a custom TMD treatment sequence for your special oral health circumstances. Healing and compassion are what we are all about.